PHOTOWORKS - A Multiverse of Images. Contains 184 pages with 166 b/w photographs. size approx. 26cm by 20 cm. 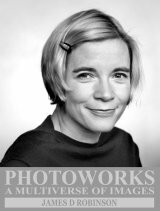 The cover image is of the author, historian and television presenter Dr Lucy Worsley - the chief Curator of the UK's Historic Royal Palaces.